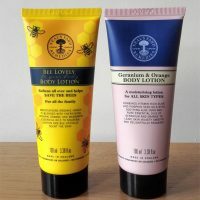 In the past few years I tried quite a few different beauty products from Neal’s Yard Remedies, but interestingly I never bought myself a toner from their collection, well not for a while anyway. Last year I bought my sister their Frankincense Hydrating Cream and I also decided to buy her Rejuvenating Frankincense Toner with that. Her skin is really sensitive, with dry patches and she also has a few fine lines so I thought that adding a rejuvenating toner to her skincare routine would help her deal with these particular skin concerns. This Rejuvenating Frankincense Toner is the best selling facial toner containing a blend of rejuvenating frankincense essential oil, calming aloe vera and a smoothing tripeptide. It contains no alcohol and it’s suitable for all skin types. What I really like about natural toners from Neal’s Yard Remedies is that they come in big, 200ml bottles, a really generous size which you don’t commonly find amongst natural beauty brands. The value for money is excellent too. 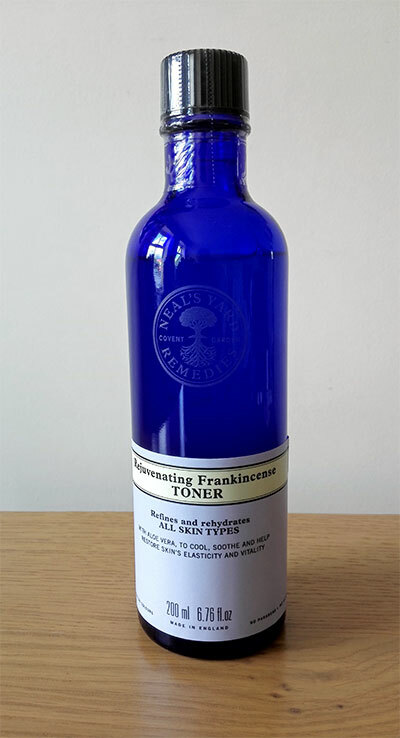 Neal’s Yard frankincense toner costs £20 per bottle which makes it £10 per 100ml. I bought 100ml natural toners in the past costing £15 or even more so £10 per 100ml sounds like a great deal. And you don’t get some cheap quality product for this price. Neal’s Yard’s products are of really high quality, certified organic by The Soil Association and cruelty-free. Rejuvenating Frankincense Toner is made with 97% organic ingredients and does not contain any ingredients that would irritate the skin (alcohol, for example). It’s actually perfect for sensitive skin, which my sister has. She has never complained about the toner giving her a rash or irritation, which happened with some of the products she used in the past. The great thing about this Neal’s Yard toner is that it’s suitable for all skin types. I used it on my combination skin and I didn’t get any breakouts. The toner worked well to remove the last traces of makeup and left my skin feeling refreshed and soothed. I didn’t find it particularly hydrating but I guess that’s not what it’s supposed to do (I love toners which are slightly hydrating like the one from Botanicals and I wish all of them would be like that!). But how exactly does this toner ‘rejuvenate’ the skin? Well, the all-important ingredient is frankincense oil which is well known for its skin rejuvenating properties. Frankincense oil helps to protect skin cells and can be even used to help reduce acne blemishes. This toner actually sounds great for combination skin as it also contains calming aloe vera (helpful if you need to treat some blemishes). The toner also contains a smoothing collagen-stimulating tri-peptide which will help you look after any fine lines you have and prevent any new ones from appearing. I quite liked this toner and would consider buying it for myself in the future. 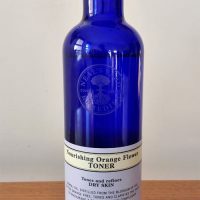 Have you tried this toner from Neal’s Yard Remedies or any other toner from their collection? EDIT: I have now bought this toner several times and it has become my go-to toner as it’s such an amazing value for money. *This post contains affiliate links. If you purchase anything after clicking on them I get a small commission which goes towards maintaining this blog. This does not affect my opinions or cost you anything.